For the twentieth anniversary of Britpop, a series of guest posts looking back at the innovators, the opportunists, the individualists who got caught up in a moment, and how they look the other side of the millennium. James Higgott works for digital comms and projects at the Royal Marsden Hospital and tweets as @jiggott. He's also drummed for bands and projects including Cop On The Edge and Dora Brilliant. Here he is in reflective mode, taking a look at The Boo Radleys' Giant Steps - I'd completely forgotten about that very early 90's cover. 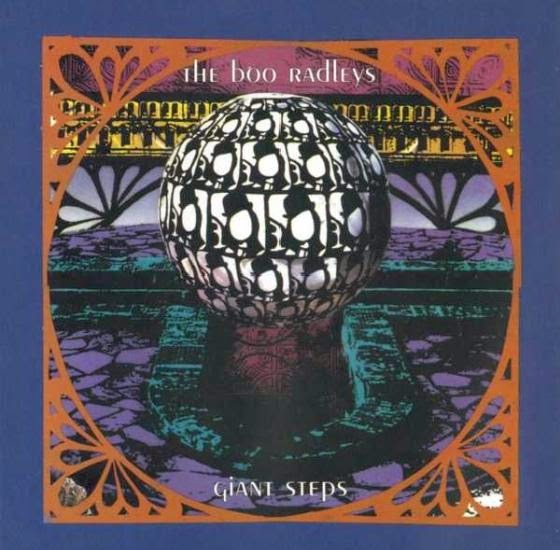 For anyone who listened to the radio in the mid-nineties The Boo Radleys will forever be associated with the alarm-clock pop of Wake Up Boo, played repeatedly by breakfast DJs until the joke wore molecule thin. But just a few years earlier, Martin Carr et al put out an album that actually bears repeating. Giant Steps is a massive, dense album of many influences, sounds, instruments and emotions. The charming guitars and slightly baggy rhythms of the early nineties are present, but they’ve been marinaded in psychedelia, dub, pastoral and feedback until they’re hardly recognisable. Leaves And Sand, which on the face of it is a formulaic quiet-LOUD-quiet-LOUD standard, deploys the producer’s full box of tricks to become something else: shrieks, effects, layers, backwards sounds, anything to make the quiet part very very quiet and the loud very very loud. It’s not just this song where the dynamics shift. Throughout the record, the luscious, soporific rise and fall of Thinking Of Ways or Best Lose The Fear swiftly gives way to the more peppy, poppy Barney (...And Me) or Take The Time Around. In I’ve Lost The Reason they’re at it again. The kids who put this together wanted to try everything. They had a lot of ideas and were comfortable shifting from one to another and back again. Listen to the album as a whole and there’s barely a gap between any of the songs. In fact, there’s usually a sonic segue of some kind - another little idea playfully inserted. None of this makes it your typical nineties guitar band experience. It’s not an album of sharp guitar pop with a couple of quiet tracks to showcase the band’s sentimental side. It’s an up and down album of nostalgia and melancholy, wide-eyed wonder and childhood glee, sometimes side by side, sometimes in the same song. If there is one constant it might be Sice Rowbottom’s delicate, fragile voice and the dark wistfulness of the lyrics he sings. He contrasts the brightest, most jangly sounding song on the album by singing, “Wishin’ I was pretty / Wish that I could twist the world round my finger”. Elsewhere, “I’m finding it hard to stay on my feet on my own / I’m thinking of ways I can get out of things just like always”. (It’s little surprise that he moved on to a career in psychology.) The lyrics evoke childhood memories and being trapped by the past (Barney (...And Me)) as well as flight from the everyday (Butterfly McQueen). Even the euphoric closing track, The White Noise Revisited, mixes sunny euphoria with lines about blades and hate welling up inside. Giant Steps came out before Britpop even knew what it was - the naive, innocent days before Country Houses and Champagne Supernovas. It was inventive, imaginative and playful with just the right amount of self-indulgence. It might not have got them an appearance on Top of the Pops but they made the John Peel Festive 50 for two years running, and we all know which of those two things is really most important. A fine review of a great album check out the Moon mix here: http://themoonfromsyb.blogspot.com/2013/08/anniversary-of-year-20-years-since.html And also find A Best of Brave Captain Martin Carr's post Boo project.